Last week we posted our first piece looking at environmental issues in Grand Rapids history, beginning with a piece from 1993 on the Grand River. Today, we continue to look at the Grand River and some key historical moments that force us to look at issues beyond the environment, or more accurately make it clear that environmental issues in Grand Rapids have primarily been the result of industrial capitalism. Commercial logging ran parallel to the development of Grand Rapids since it founding in the 1830s (even though Grand Rapids was not incorporated until 1850). Logging was the result of general construction, the building of homes and of course the growing furniture industry. The Grand River provided a convenient mechanism for transporting felled trees that were growing near the banks of the river upstream from Grand Rapids. 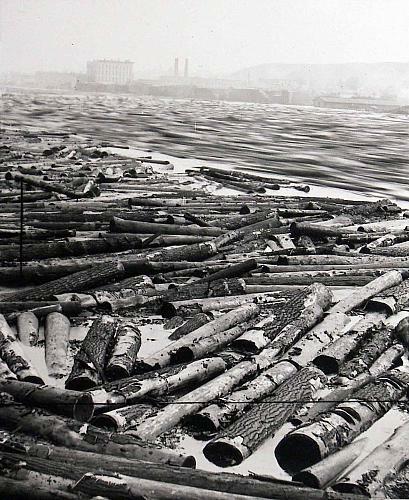 The increased demand for lumber resulted in increased soil erosion along the banks of the river and contributed to the major floods during the later part of the 19th century, into the early 20th century, before the flood walls had been constructed along the Grand River in downtown Grand Rapids. 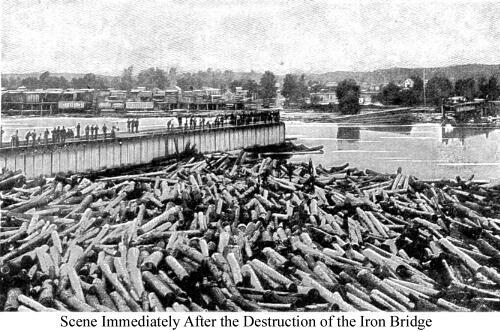 Grand Rapids historian Gordon Olsen notes that an estimated 80 million board feet had broken free from the log boom owned by the Grand Rapids Booming Company and the many of the logs ended up jammed by the bridge being built near what is now Ann Street. You can see in the photo above how the logs were all jammed up. One consequence of the 1883 log jam was the flooding of the westside of the river. 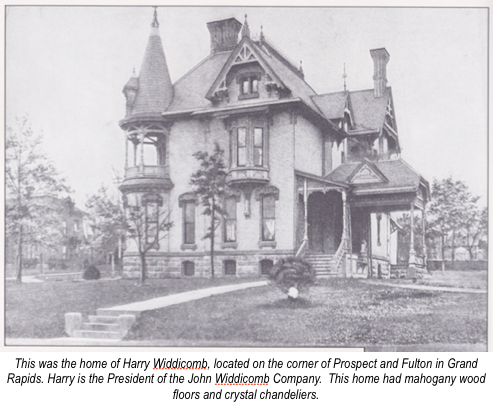 The area on the near westside had been historically a working class area, since many of the furniture factories were located on either side of the Grand River. Many of these working class families had major damage done to their homes as a result of the flooding, which was caused in part by the log jam. In fact, the commercial development along the river was an increasingly contentious issue for people living on the westside. 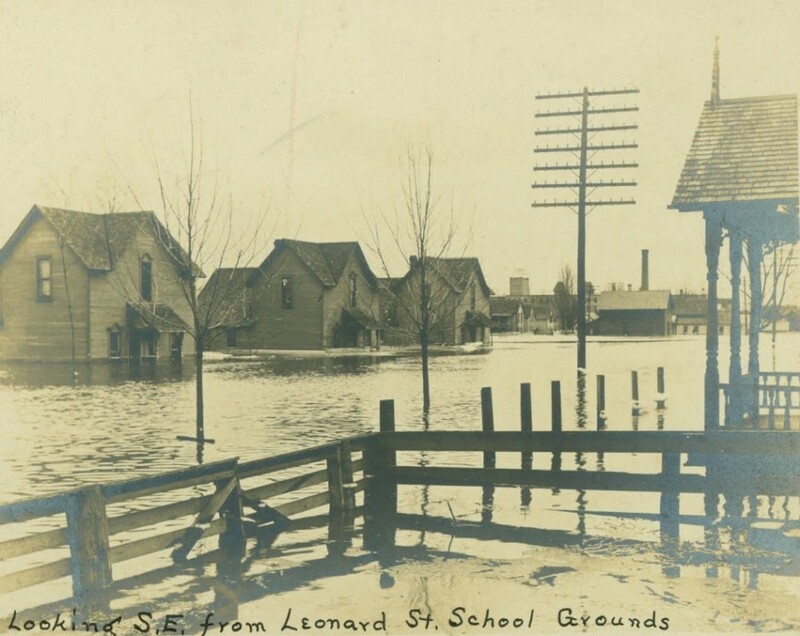 Mayor George Ellis raised this issue during the 1904 and 1905 floods in Grand Rapids. Jeffrey Kleiman, in his book Strike!, cites Mayor Ellis who was frustrated by the wealthy developers who were buying up property along the Grand River. Ironically, these rich men that Ellis refers to, the furniture barons, lived up the hill, like Harry Widdicomb, who’s house is pictured here. 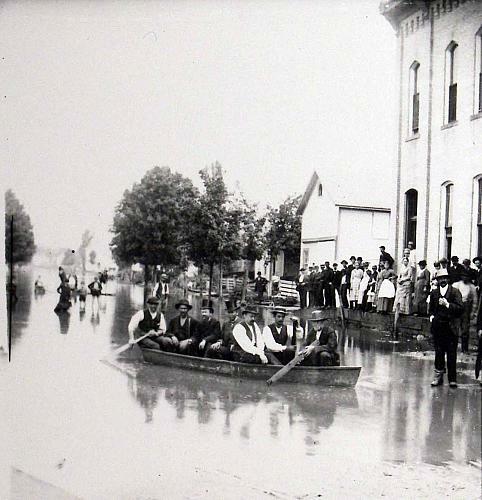 The capitalist class of Grand Rapids did not have to deal with the consequences of the floods during the late 19th century and early 20th century, like the working class people, many of them who worked in the furniture industry. You can see in the following two photos how many working class people were forced to evacuate in boats ( first photo) for a period of time because of the flooding along the Grand River and how the flooding caused damage to the modest wooden homes seen in the second photo below. Therefore, one can see that the very existence of environmental degradation was caused by industrial capitalism, which was the whole reason the environmental movement came into being in Grand Rapids and around the world. This entry was posted in Environmental Movement and tagged deforestation along the Grand River, flooding along the Grand River, furniture factories along the Grand River, the Great Log Jam of 1883, working class families on the westside. Bookmark the permalink.